Melt chocolates separately over double boilers. Remove the stem-only from the strawberries. While holding the top of the strawberry, dip the strawberry in the milk chocolate 3/4 of the way up and set on temp-tations Silicone Oven Liner. Do the same for the rest of the strawberries. Place in refrigerator for 10 minutes until chocolate hardens. Once chocolate hardens remove strawberries from the refrigerator. 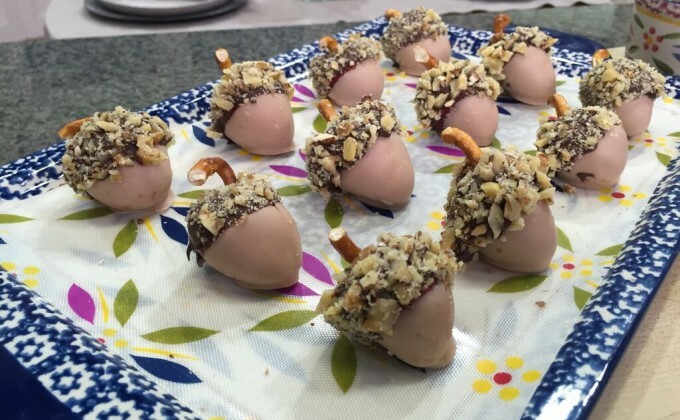 Hold the strawberry from the dipped tip and dip the top of the strawberry in the semi-sweet chocolate and then into the chopped walnuts. Place a pretzel stick in top. Do the same for the rest of the strawberries and then refrigerate until set. Serve on your temp-tations Lid-It®.